My boy is an adventurous little thing, he will climb on absolutely everything! He shows no fear, no recognition of boundaries and is generally oblivious. Bubba would jump, climb and get stuck in but she showed a bit more savvy. For instance, she would make sure a cushion is on the floor before she jumps. Cub will daringly just step off regardless and when he falls flat on the hard floor, he will lay still deciding if it hurt or not. He will then manically laugh (if it didn't hurt) or cry if it did. Along with this devil may care attitude comes the ability to run and run he does. Away from me. EVERY SINGLE DAY! 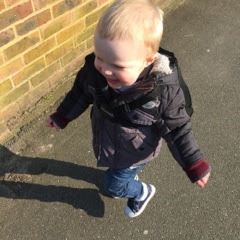 He runs and then has the smallest of turns of the head just to check I'm there before he lets out a giggle and goes further and faster and freerer. It's a joy sometimes to watch if we are somewhere safe where the exhilaration of it overtakes us both. But it's annoying and scary as hell if we are anywhere near a road, in a supermarket or in a car park. I literally have to drip everything and run after him, it's also chilling to the bone if I have Bubba with me, choosing which child is safer alone and often shouting at her to stay put and trusting that she will, raises my blood pressure to the max. 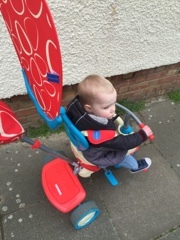 He shuns the buggy now, I used to eye roll women who would say 'oh my toddler won't go in the buggy anymore' I'd think they were being weak or couldn't control their child. Now I know, yes I can get him in the buggy (just about as he's so strong) but it's difficult and makes me want to pull my hair out the whole time. So the walk to school and home every day is a challenge with him, if I let him walk...he runs or becomes like a plank and will not move. So we got him a trike, it worked and then the trike broke and I was back in the wilderness. So we got a new trike and I feel like a new woman. He thinks he's cycling and I get to guide him. I don't want to curb his wanderlust but I need to keep him safe. Reins don't work, if you put them near him he will collapse on the floor screaming. I'm hoping his desire to run becomes less prevalent as he grows up or should I say it becomes more focused. It's my go to assumption...it's a phase, it will pass. I do hope so because we keep ending up being late everywhere because I have to try and convince him he's going the wrong way!